If you're more of a porcelain-kinda-girl, versus the glass dome type, check out these pretty cakestands at The Village Whites Shoppe in Gardener Village. Not only do they come in all sorts of sizes, they are also reasonably priced. i have fallen head over heels for the plates on the left. Are the cake stand on the left $9.95?? If so, I want one! Jennifer, I believe the small one is 9.95. Great, no? I need these! 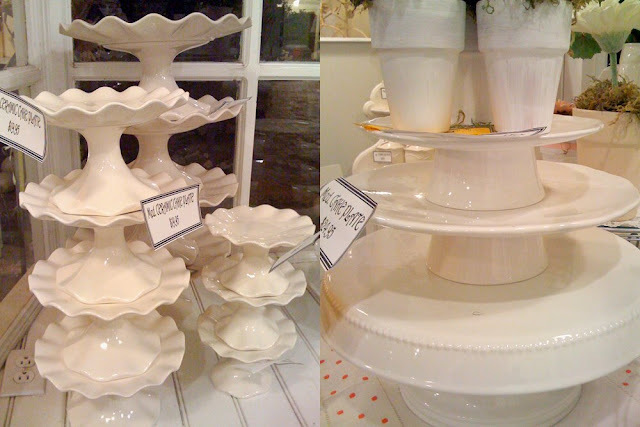 I love the porcelain--have you seen any porcelain cake stands with covers? Thanks for the suggestion, I've been looking for pretty cake platters. I went and got mine yesterday!